Board View's powerful drag-and-drop interface makes it the go-to view for agile teams, but every user can utilize the convenience offered in this view. 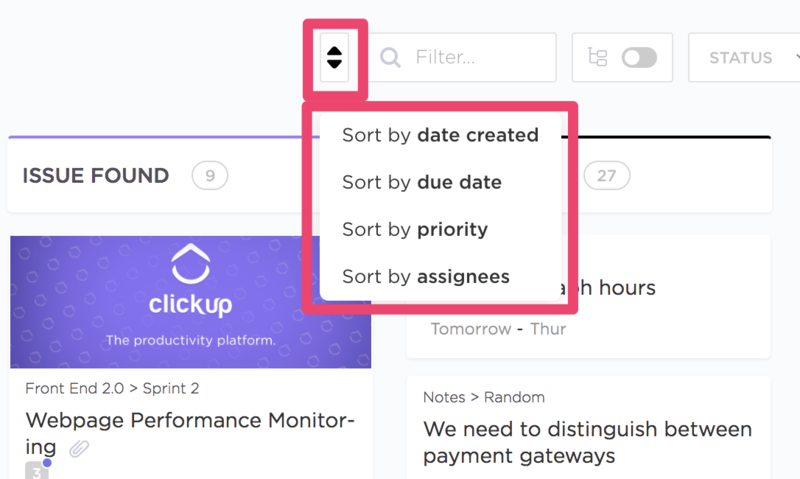 ClickUp expands functionality to boards by allowing you to delegate tasks, set due dates, and view subtasks' statuses. Additionally, instead of arbitrary column names, ClickUp's columns are simply titled with the statuses associated with each task. 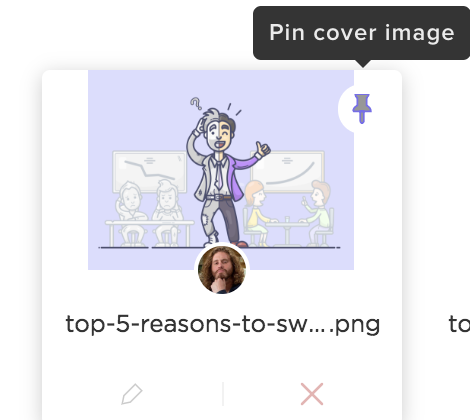 ClickUp's Board View stands out by allowing users to implement custom statuses. These statuses embody the life cycle of your tasks, and can be changed at any time based on user preference. With custom statuses set, each column is a stage in your workflow, and each row is a task that can moved throughout your board with ease. Do you prefer simple "Open" or "Closed" statuses for your tasks? Board view with simple statuses is a bit simple, but this allows you to make use of drag-and-drop functionality without any unnecessary clutter. In Board View, task cards can display cover images. Learn how below! Board View is unique in that it arranges everything by status. But what happens when you view Projects or Spaces with different custom statuses? Or Select all to reveal the Multitask Toolbar. You can then change the status, due date, and more for all tasks within the column. 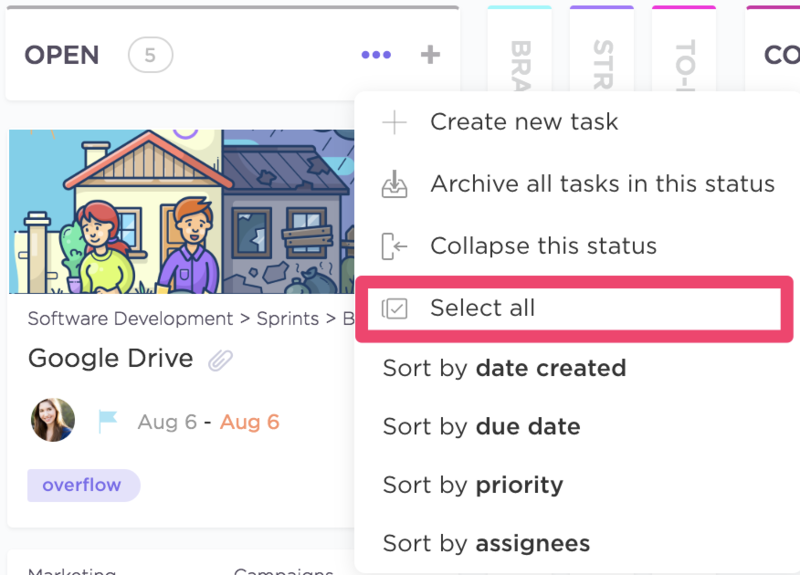 Drag-and-Drop: A key aspect of Board View is the ability to quickly move tasks through workflows and adjust their priorities. Easily drag-and-drop a task into any status (including collapsed statuses) and move the task up or down to change the priority of the task. Change Assignees: There's no need to open a task to remove an assignee in Board View. Simply click on the avatars under the task to create, add, or remove assignees. Quick-Create Tasks: Click the + in the upper right corner of any board to add a task in Board View. The new task will adapt the custom status of the Board in which it was created. Adjust Due Dates: Again, no need to open a task to make changes. Just click the calendar symbol next to your task's avatar symbol to quickly update. Filter by Project vs. List: Focus your workflow and filter by an entire Project, or just a single List. Just select the specific Project or List in your left sidebar. 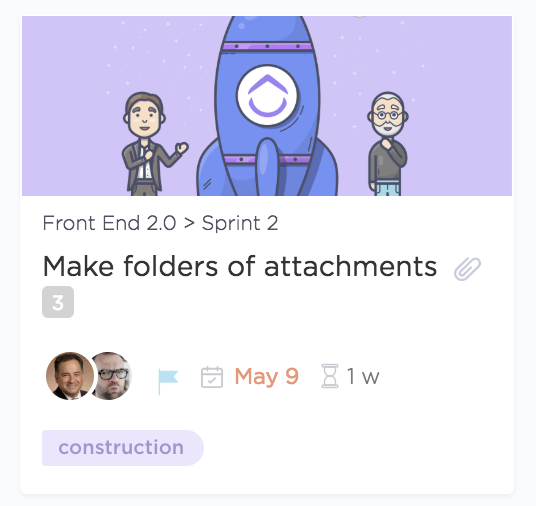 Add Tags: Organize tasks on a whole new dimension right from the Board. Simply hover over your task and click the tag symbol to edit or create a tag. Drill down and view specific action items by filtering your tasks in Board View. Opt to view tasks with specific tags, due dates, assignees, and more. You can even enable compact viewing for your tasks in Board View. With this feature, you'll reduce the icon and font sizes for your tasks, as well as the amount of white space shown on your screen. 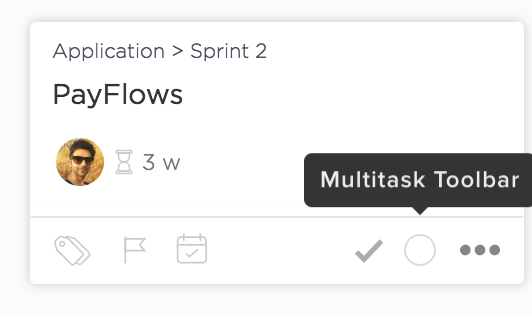 This allows twice as many tasks to appear in your Board View at any given time. Filter out the statuses that aren't important to what you need to see by collapsing the status in Board View. Don't worry, you can still drop tasks into Collapsed status columns. Be sure to check out Time View for more options to schedule and manage tasks with our drag and drop functionality! 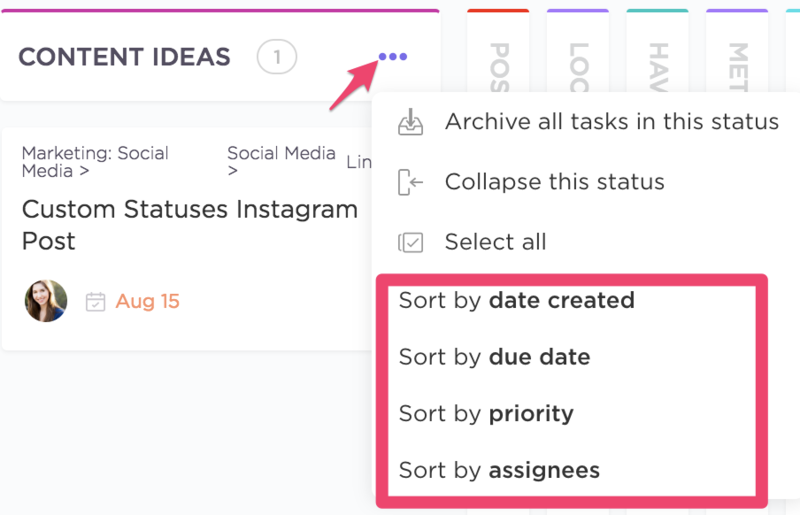 Want to see even more tasks on your page? Check out our compact views for Board and List Views! Let us know what else you would like to see on our feedback board here!